Suzie's Maps founder Suzie Willcox demonstrates how to use the kiosk in the South Hill Rosauers. Suzie Willcox expected the doctor to say something was wrong with her heart. She'd been having dizzy spells, and both her parents had died of massive coronaries. So the true diagnosis — diabetes — came as a surprise. Another surprise came when Willcox, who had always been a good cook and conscientious about nutrition, took a diabetes education class and realized how difficult it can be for newly diagnosed people who are learning about healthy meal planning for the first time. "I was pretty shocked at people not knowing the difference between a carbohydrate and a protein," Willcox says. "I just started thinking about that: 'Gosh, this is really hard for people — and it's hard for me. I wonder how I can make this easier?'" She's recalling the story at the Rosauers grocery store on 29th Avenue, seven years after she was diagnosed. Nearby is the answer she's been puzzling over and planning all that time: a cheerful, bright-green kiosk that greets shoppers as they head toward the produce section. 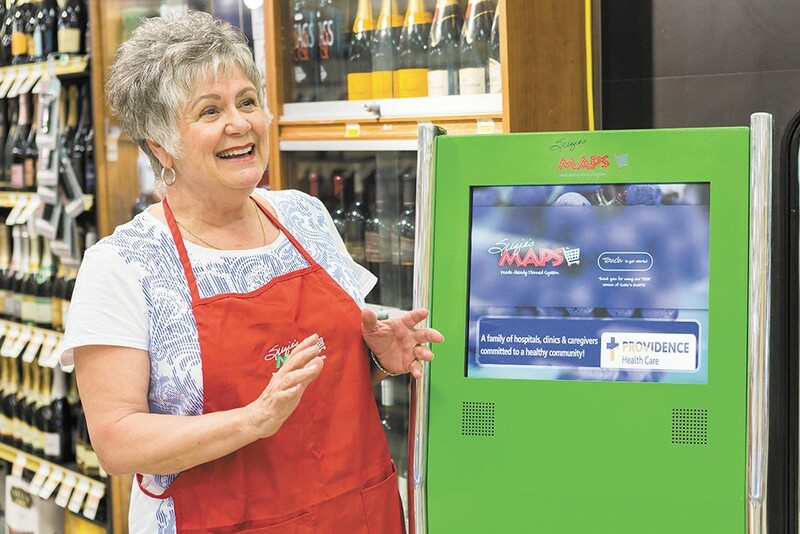 This is Suzie's MAPS — Meals Already Planned System — one of three kiosks installed in local Rosauers stores for beta testing. The touch-screen guides users through the options: Select the number of people you're cooking for, choose one of several featured recipes, and then take the printed recipe and shopping list to finish the meal. What differentiates Suzie's MAPS from the abundance of recipes on the Internet is the careful thought she puts into it — the recipes change based on the weekly specials, and ingredients are organized by the aisle where they can be found in that particular store. A healthy menu plan doesn't do people any good if they can't find or afford the ingredients, Willcox says. The diabetes menu is Suzie's MAPS flagship, but the kiosks also have menus for heart-healthy and gluten-free meals — and others in the works — with the same goal of linking healthy intentions to actual shopping. "They can just come in, and they don't have to think about calculating anything," Willcox says. "Here it is, and they can just use it." The problem Willcox identified after she was diagnosed is well-known to doctors and educators: It's difficult for people to successfully form new eating habits, even if they know it's important for their health. The ideal diet for people with diabetes is essentially a healthy one — it's not about restrictions so much as about balanced, consistent meals to keep blood sugar in check. Each experience is different, but patients diagnosed with diabetes are typically referred to group classes or one-on-one sessions to learn about the disease and how they should be eating. But following through can be challenging, says Megan Bolam, a registered dietitian and certified diabetes educator with Providence Health Care. "When they're first diagnosed, some people can be so overwhelmed that it's better to find out what they're doing well and then introduce small steps," she says. Many factors can make it difficult: old habits, cost, other family members' preferences, conflicting information and confusion. Patients often have other health issues as well, and must work closely with their team of health care providers. "One of the most important things is to really have a good support team," says registered nurse Anne Vold, another certified diabetes educator with Providence. Providence has been an enthusiastic supporter of Suzie's MAPS, sending out information to employees and putting posters in the elevators so patients and caregivers know where to find kiosks. Particularly because of the convenience and customized recipes, Bolam and Vold believe Suzie's MAPS can be a part of that support patients need to successfully follow through with diet changes. Aside from the acronym, Suzie's MAPS also represents the way Willcox envisions diabetes as sort of a journey, with her menu plans helping others find the way. She and her husband, Greg, have owned businesses for decades, but this is the most personal, and every decision has her detail-oriented touch. Energetic and persistent, Willcox went through many versions and disappointments — "doors closed and heartbreaking things" — before getting to the version that's had an overwhelmingly positive response at demonstrations. Providence and Rosauers have both been encouraging, she says, as are the smiles from people who try out the kiosk and say it's a good idea. "I'm still dazzled when I hear that, and it pleases me so," Willcox says. "I guess I'm amazed at all this." The team has eagerly incorporated feedback about improving the system — Rosauers suggested more photos of food, a father asked about displaying nutrition information with the recipes — and has plans to add other features, like showing the price associated with a convenience option vs. home-cooked. Willcox would like to have menus for a full range of allergies, and also plans to have novelty menus like a Mother's Day brunch for dads who are shopping and cooking.